Drive to Azurea. You’ve reached the edge of the continent. You can’t drive any further without sinking (unless you drive one of those land-and-sea duck tour tanks). Step out of your car (did you tip the valet? 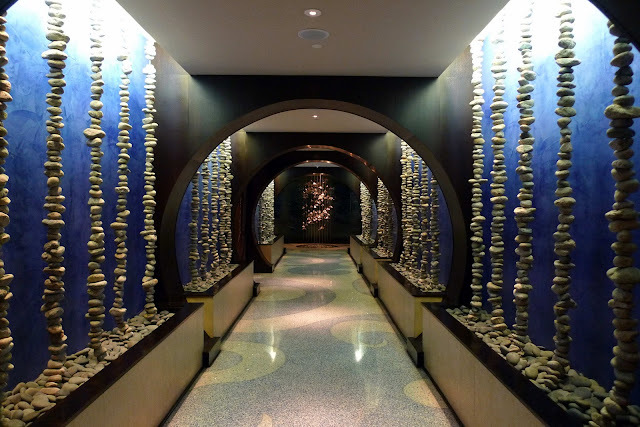 ), enter the beautifully appointed lobby of One Ocean Resort, and walk through an aqueous blue tunnel that officially symbolizes your passing from a terrestrial world to one ruled by the sea. Now take a deep breath and enjoy the view. The folks who decorated this restaurant at the water’s edge appropriately drew inspiration from the vasty deep. Witness: lots of deep blues and greens and wavy lines and big white-edged picture windows that frame the ocean dunes and let in an abundance of natural light. And the restaurant’s name, Azurea, which conjures images of a vivid blue underwater world. Azurea feels fancy, but not uptown-chic fancy. It’s beachy fancy, which means I got away with wearing khakis, a sparkly shirt, and fancy sandals for a recent Friday dinner. I like that the people who created the atmosphere at Azurea paid attention to potential local clientele and the vibe at the beach, where most folks don’t wear shirts or shoes for five months out of the year. A lot of times these fancy hotel restaurants can get pretty prim and stodgy and dull. Although the high-backed semi-circle booth we sat in was constructed of opulent and textural fabrics and the overall feel of the dining area is that of an upscale hotel, there’s not a white tablecloth in sight and the warm and friendly staff throw any potential stuffiness right out one of those dune-framing picture windows. Ah, the staff. I can’t say enough good things about The TJ. He attended to our table throughout the evening and by dessert, I felt like we’d been friends for years. He was young, which obviously contributed a youthful and un-stuffy vibe to the experience, yet he really knew his stuff. Wine pairings, the historical lineage of kurobota pork, any question I threw his way about the menu. You could tell he has a real passion for food, wine, and pleasing his customers. Chef Ted Peters has cooked around the globe - London, France, the Caribbean, Miami, Texas, Boston - and you see glimpses of these global influences in Azurea’s menu. It changes with the seasons, which is a good thing for those who appreciate seasonal fare and for repeat visitors to Azurea. But it’s a bad thing if you head to the restaurant expecting to see a specific below-described dish on the menu. I like the look of the autumn line-up – you can find it here. If you’ve got the cash for it, I’d suggest trying the Adventurous Palate tasting menu. Chef Ted Peters and his sous chefs will construct a menu based on your personal preferences, what’s fresh and in-season, and the whimsy and creativity of the cooking team. 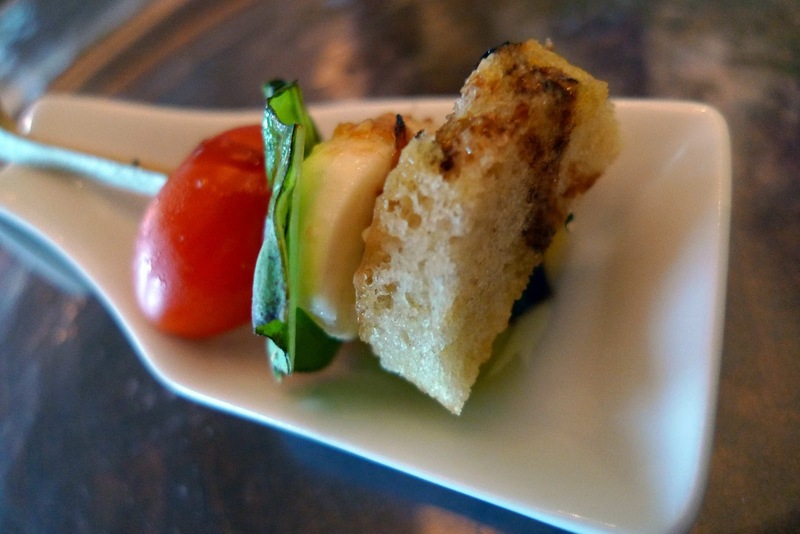 Our first taste of Azurea was an amuse bouche that evoked summer like no other dish can: a tiny tomato, a single leaf of basil, and a slice of mozzarella strung on a dainty little stick and anchored by a square of olive oil and balsamic-soaked bread. Could have perhaps been a bit more creative or artfully presented but, like I said, it tasted like summer. I like summer. The wine list at Azurea is as thick as a phone book, and TJ seemed to be intimately familiar with the entire selection. Phil and I each ordered a glass of citrusy Handley Gewurtztraminer to accompany our appetizers and bread course. Bread course, you ask? Azurea presents all guests with an impressively well-though-out bread service: a basket of assorted breads with four spreads presented on a long, transparent blue plate that echoes the aquatic theme of the restaurant. It’s even brought out by a separate waiter, so it feels extra special. The sundried tomato and kalamata olive tapenade had an incredible depth of flavor and complexity. It was my favorite spread by far and displayed an admirable balance between the saltiness of the olives and the acidity and sweetness of the tomatoes. Also delicious were the creamy elephant garlic confit with Maldon sea salt and the parsley-sprinkled Vermont Butter and Cheese Company European-style butter. The butter tasted fresh and its sweetness reminded me of the butter I used to devour by the stick in Switzerland. 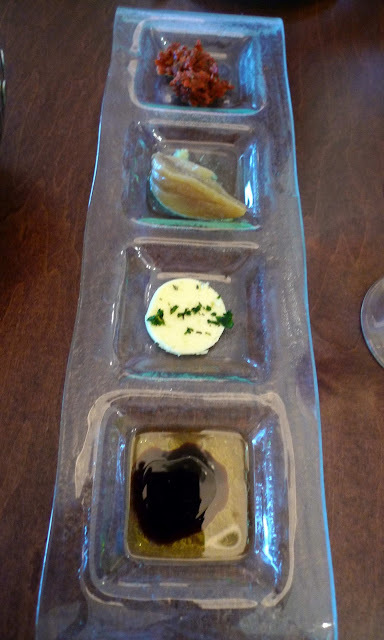 The bread service also included your standard olive oil and balsamic vinegar combination. We had fun trying each spread on different types of bread. 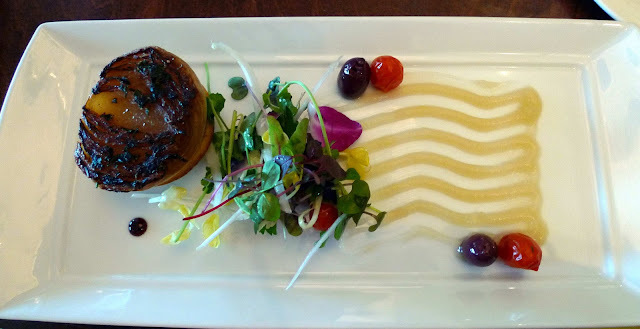 I chose the caramelized Vidalia onion tarte tatin with melted mini heirloom tomatoes, cured Niçoise olives, and Indian River lime emulsion. The Chef really respected the onion, know what I mean? The caramelization brought out the natural sweetness of the Vidalia and instead of falling apart in a limp and soggy heap, the onion retained its texture. Serving it with the caramelized side up made for a nice presentation and although I wished for some sort of element to tie the onion with the pastry crust underneath – maybe a sauce or some other juicy element to penetrate the dryness of the pastry? – I happily drug the onion tart through the sweet lime emulsion and alternated bites of the warm, juicy, squirty tomatoes with the onion. The lime emulsion also served to dress the salad of watercress, herbs, and crunchy strips of jicama. Phil and I had a tricky time deciding on our mains. TJ recommended the hand cut Wagyu beef tenderloin and the Spice Island duo of Caribbean pork and grilled scallops. But, probably because we had just passed through that tunnel into the underwater world, and seeing as we were surrounded by such an undeniably aquatic atmosphere, it felt appropriate to order seafood. 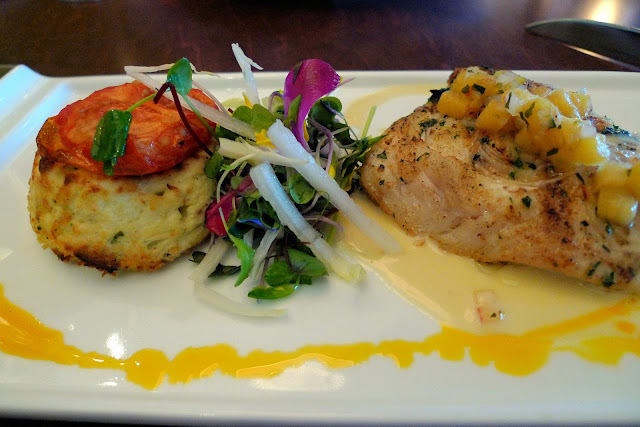 Hence Phil’s grilled Atlantic snapper with pineapple lime salsa. The fish was firm, moist, and flaky and well-complemented by the sweet fruit salsa. However, Phil was disappointed in the bleu cheese “cheesecake” served with the snapper. It was the side of the day and the heavy, custardy texture and intensely rich flavor overpowered the mild fish and delicate sweetness of the fruit. Phil doesn’t particularly like bleu cheese in the first place, and he wasn’t given a choice of sides, nor was he informed of the side until the plate arrived to the table. I love bleu cheese and this side would have gone well with a richer protein. Like that hand-cut Wagyu. But with the snapper, not so much. TJ paired Phil’s snapper with a glass of DR Loosen Riesling. Again, good choice for the fish but not for the bleu cheese cake. 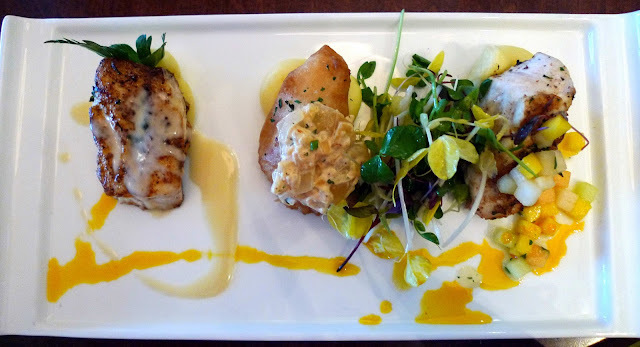 I also took the seafaring route and ordered the Fresh Catch, Three Ways. It was just like it sounds: the catch-of-the-day – grouper – prepared three different ways and propped up on puffs of creamy mashed potatoes. Let’s look at each fish preparation, starting from the right and heading to left. The grilled fish with a tropical fruit salpicon was immensely refreshing and a perfect summertime preparation. I wished I’d eaten the beignet battered grouper with smoked Vidalia onion remoulade first, since as with any fried food it got a bit soggy as it sat. However, I’m a sucker for fried stuff and I loved the light batter. Overall the remoulade was tasty and a good choice for the battered fish, but I found myself wishing the onions had caramelized and softened a bit more. I wanted them to melt into the remoulade but they were still too raw and bitey for my liking. 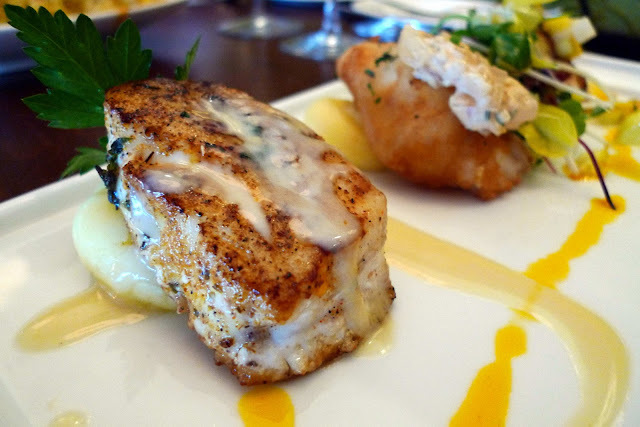 Of the three preparations, my favorite was the bronzed fish with a citrus butter emulsion. I love that term – bronzed. It was lighter on the spices than a blackened preparation and the subtleness of the seasoning really allowed the freshness of the fish to shine through. Plus, the word “bronze” reminds me of summer days at the beach slathering myself with Hawaiian Tropic. Good times, good times. TJ paired this dish with a bright and crisp Sonoma Cutrer Russian River chardonnay. It was a good choice for pairing with an array of preparations, and I liked that it was well-balanced and not too oaky. In the interest of research, Phil and I also ordered a side dish of four cheese baked macaroni. It was totally unnecessary. 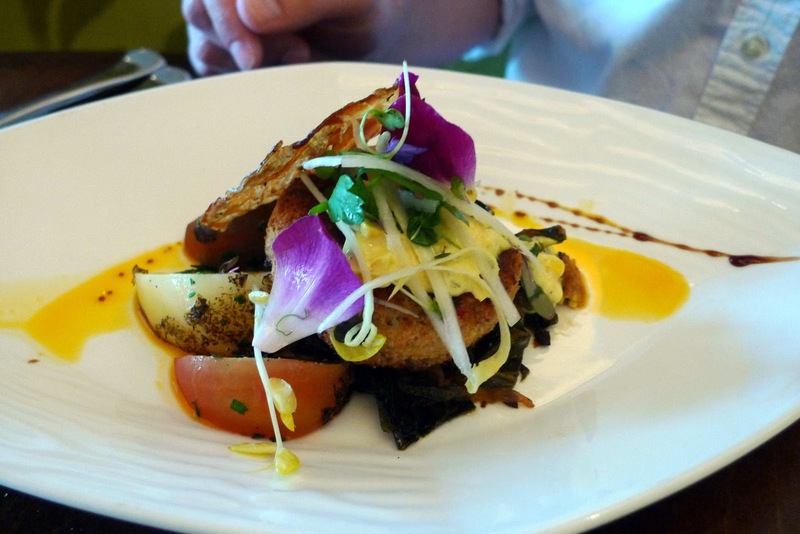 Unlike some upscale eateries, the portion sizes at Azurea are more than ample to satisfy a hungry person. But, hey, I’m only human for being unable to pass up a cheesy mixture of asiago, cheddar, parmigiano, and manchego tossed with curly pasta and topped with crunchy breadcrumbs. Cellentani pasta really is a superior choice for macaroni and cheese. Its curves and nooks and crannies catch all that cheesy béchamel, and the fresh breadcrumb and parmigiano topping allowed for a bit of crispness in every bite. Also unnecessary but impossible to pass up was the bittersweet chocolate soufflé with vanilla crème anglaise. Apparently Nancy, the pastry chef at Azurea, was the food stylist for the Horse Whisperer and has baked her way around the globe. 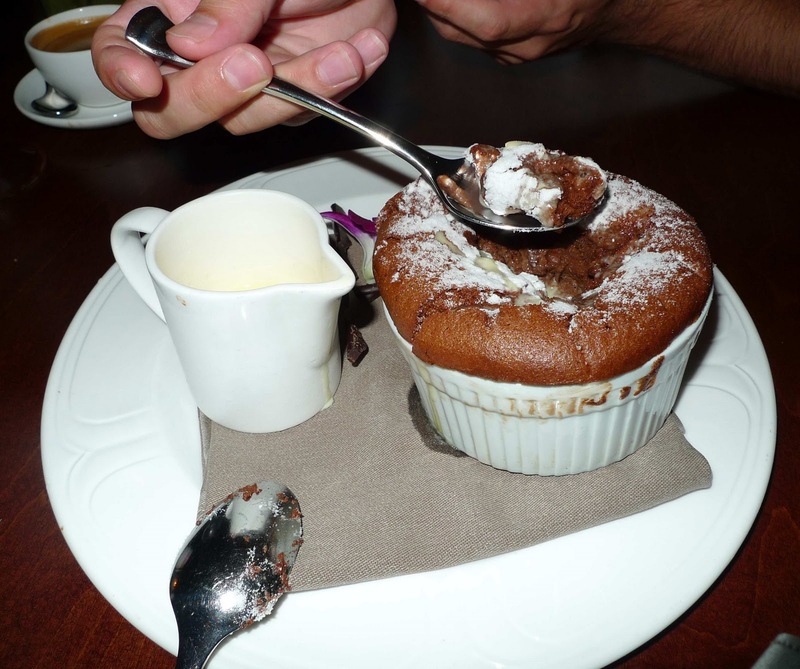 The soufflé required advance notice and as such arrived warm, straight from the oven to our table, with a decadent, gooey center and a little pitcher of extra crème anglaise to drizzle in the center once we’d scooped out a few spoonfuls of silken chocolateyness. A couple shots of espresso rounded out a very enjoyable dining experience. So here’s where it needs to be said that Phil and I didn’t… well… we didn’t pay a cent for the meal. We were invited by the restaurant. I was initially uneasy about accepting free stuff – expensive free stuff, to boot – but I’m only human and I’d really been wanting to eat at Azurea and to meet Chef Ted Peters in person. I think his involvement with the James Beard Foundation has the potential to bring national exposure to Jacksonville and the First Coast. And hopefully his relationship with other local chefs (he’s invited a few of my favorites to cook for a big James Beard dinner in the spring) is another step towards creating a culinary identity for our city. Chef Ted came out and spoke with Phil and me after each course, and his passion for food and fine dining was inspiring. But… I couldn’t help notice that, on a Friday evening, there were only two other tables of diners. I’ve heard a similar story from other friends who’ve dined at Azurea: the restaurant is beautiful, the food is good, but often, tables are empty. Why? I think partly it’s because the economy isn’t going so great, in case you didn’t hear, and fine dining is one of the first and easiest things to cut out of a tight budget. 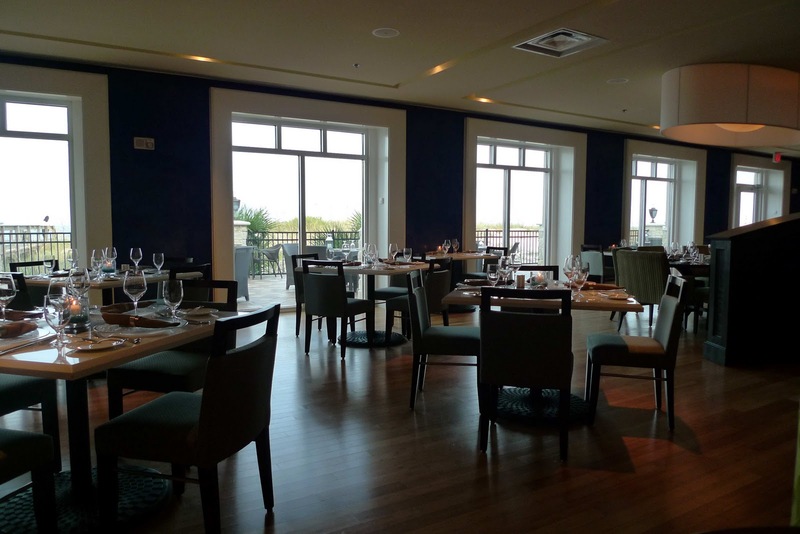 And it’s not just that the prices of entrees hover in the upper $20 to lower $30 range; I think it’s also the simple fact that Azurea is a restaurant inside a fancy hotel, and as beachy-chic and locally-oriented as they try to be, there’s no denying that. I do have to say that the dishes were presented like… like… hotel dishes. Which isn’t necessarily a bad thing, but it’s not for everyone. Another issue I’ve heard about Azurea relates to consistency. I’ve told friends about my great experience dining there and they didn’t seem to have received the same attention and quality as Phil and I did. I know food and dining is a subjective, personal experience, but it’s worth pointing out, especially since we were invited guests. A friend shared a photo with me of a disappointing macaroni and cheese they were served at Azurea. It didn’t look nearly as cheesy as mine, nor did it have as much of that delicious breadcrumb topping. I urge you to dine at Azurea and form your own opinion based on your experience with the food and service. For most of us, it’s a special occasion kind of deal. I think it would be very difficult to walk out of there without spending less than $100 for dinner. But think of the breezes, and of the ocean view – sadly, a rare thing offered by restaurants in our city by the sea. For some, that view is priceless. Another fine job Cari! You need to give me a lesson in food/wine photography. 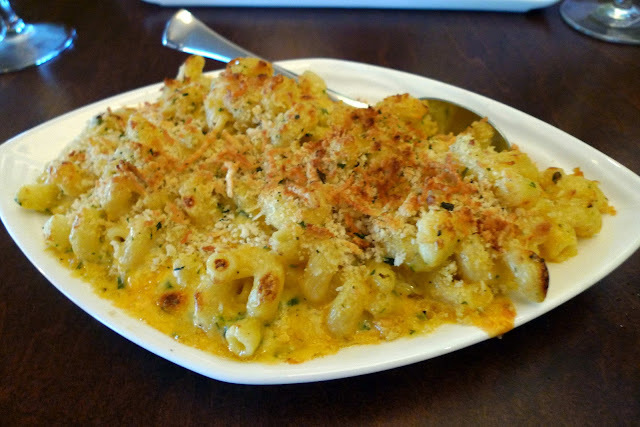 Goodness, that photo of the mac and cheese is sinful! Can't wait to try this place out since it has been on my wishlist since it opened, but I've been reluctant to go since I feared it was too formal. Thanks for reassuring me, Cari!! Loved this review! Loved the intro, drive any further and your car will sink. Been dying to try this place but it's not exactly a cheap eats. Perhaps for happy hour (if there's one) or desserts. What a romantic location, we had a wedding reception not far from there. Thanks for sharing!